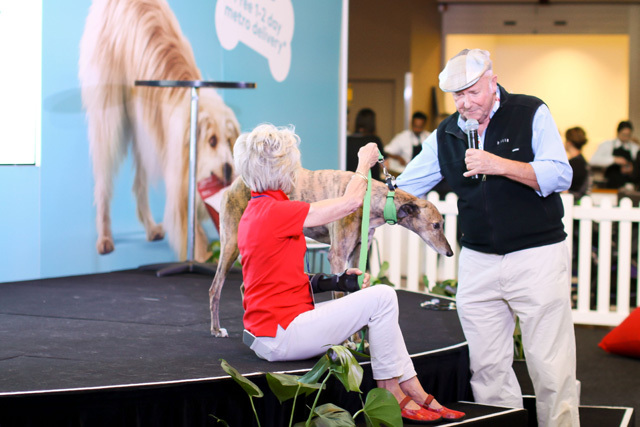 The very popular Pet Circle Stage presented expert tips for a healthy and happy Dog! Visitors received expert tips for a healthy, happy Dog with educational, entertaining & informative talks that covered training, behaviour, health & lifestyle for their Pooch! The stage was MC’ed by best friends Lise Carlaw and Sarah Wills (also known as Those Two Girls) from Southern Cross Austereo’s HIT Network. Australia’s newest Bondi Vet Dr Alex Hynes discussed What to do in a Pet Emergency. Dr Teagan Lever and Elissia Beard from the Pet Circle veterinary team discussed Sniffing out the truth – debunking common Dog myths. Dr Katrina Warren & Kelly Gill presented two new talks covering easy tricks you can teach your Dog at home and how to give your Dog a happy and enriched life which were followed by a meet & greet with The Wonderdogs. The much-loved Dr Harry Cooper spoke on two talks about solving the most common Dog health problems and how to choose the right breed for your home & lifestyle. Would you know what to do if your Dog was in a life threatening situation? Dr Alex will talk through the most common pet emergencies like heat stress, tick paralysis and toads and give her tips on how to keep your four legged friend safe this summer. Dr. Alex Hynes is an emergency veterinarian with an extraordinary passion for animals, life and her veterinary work. After growing up riding horses, milking cows and lambing sheep, her love for animals is really no surprise. Her work in Emergency & Critical Care involves treating of the sickest of sick dogs, cats and wildlife in Queensland. Alex was inspired by the vision of Animal Emergency Service back in 2007 and is now one of the directors and is grateful every day to work in a hospital that practices the highest standard of patient care, values and teamwork. While impressive, it’s not just her qualifications and experience that make her such a uniquely outstanding veterinarian. Alex has a phenomenally well-rounded lifestyle, participating in martial arts, strength training, and horse riding – all while excelling in an incredibly demanding role at work, raising her beautiful young daughter and giving up her remaining precious time to charities. Always by her side and considered one of the team at the hospital, Alex’s stunning Samoyed dog Yoshi is her constant companion at public events, and is picking up quite a fan base of his own. Alex has dedicated her life to educating pet owners and advancing the area of emergency and critical care in veterinary medicine, so that any sick and injured animal can have the care they deserve at any time of day or night. “Every Dog can be a Wonderdog and teaching tricks is a fun and rewarding way to enhance the bond you share with your Dog. Popular television vet, Dr Katrina Warren has teamed up with professional trainer, Kelly Gill and the Wonderdogs; a team of impeccably trained chocolate border collies. The Wonderdogs are seasoned performers and have appeared with Katrina on the Today Show, Morning Show, Funniest Home Videos, Saturday Disney and Talk to the Animals. They have also starred in numerous TV commercials and feature films and it’s a very rare opportunity to see them all perform here at the show in Sydney. When to seek veterinary attention for your Dog is a question that Dr Harry Cooper has been asked a lot during his five decades as a practicing veterinarians in Australia. Don’t miss this opportunity to learn from one of Australia’s most loved and successful vets. Born and raised in Sydney, Dr Harry Cooper graduated with second class honours from Sydney University’s Faculty of Veterinary Science in December 1965 aged 21. He practised for several years in Sydney and the UK before his burgeoning media career became a full-time commitment. Dr Harry first started his media career on breakfast television as network vet. Sometime later he joined a popular radio show as the resident vet and this soon expanded into a popular television series on the 9 Network. Dr Harry moved to Channel 7 in 1993 to host his first series ‘Talk to the Animals’. In 1997, Dr Harry returned to consulting rooms to film a new series, ‘Harry’s Practice’ which ran for 6 years. Dr Harry immediately joined the team at ‘Better Homes and Gardens’ and has been providing pet information and advice to viewers ever since. During his career Dr Harry has owned and bred Dogs, Cats, Budgerigars, Horses, Rats, Mice, Rabbits and Chickens! “Variety is the spice of life and Dogs can get bored if they don’t have mental and physical activities to keep them occupied. In this highly entertaining and informative talk, the much-loved Dr Harry Cooper will provide valuable insights into the important things you need to consider when selecting the right Dog breed for you and your home and lifestyle. The way in which we live has changed dramatically over the past 10-20 years and this has had a major impact on the dog population. Gone are the days when majority of dogs seen by vets weighted over 15kgs and were housed in large backyards. High rise living is on the rise and contrarily dog sizes and weights are decreasing over time. Choosing a Dog that is a match with your lifestyle should be carefully considered including how much time you realistically have available for train, exercise and play with your Dog, the size of your backyard and perhaps how long will it be left home alone. Pet Circle Veterinarian Dr. Teagan Lever and animal expert Elissia Beard will bust some common dog myths. How to properly feed, groom, train and take care of your dog are topics that have always been plagued with myths. Some hold merit, while some are so outlandish it’s amazing they caught on in the first place! From old waives tales to true medical facts, the Pet Circle team will bust and confirm some common myths and give some great tips in the process! Elissia is a vital part of the pet loving product team at Pet Circle. While she is relatively new to the pet industry, she has a wealth of pet owning experience having owned dogs and cats her whole life! Currently she is the proud parent of a black 10 year old Labrador named Tynan, 13 year old blue heeler named Willow and an 18 year old Burmese cat named Milo.